The cold snap we are having reminded me of skating on the Bay back in 1962. Here is an excerpt from The Chesapeake Watershed that describes that scary but thrilling experience. My friend Greg, who lived on the Bay near the mouth of Bush River, led the way down to his pier. We were in a cold snap and it was indeed very, very cold. The temperatures had been hovering around zero for the past week. The ground crunched as we walked, and within minutes my nose and fingers grew numb. I glanced at the bay and as far as I could see there was ice, quite rough along the shore, but it did look like we could skate farther out. Momentarily forgetting that it was saltwater, I convinced myself that it must be safe. Greg and I slipped, stumbled, and climbed over the rough ice along the shore and worked our way out along the pilings of what used to be a dock. The wooden pier was in shambles, having been heaved up off its moorings by the ice. Just past the pier, the ice was flatter. The farther out we skated, the smoother it became. It was hard and seemed quite stable. Yes, I was scared, but I was so focused on not falling and on keeping warm that I managed to follow Greg out away from shore. He was small, spidery, and fast. I was bigger, and my ankles were already sore from trying to balance on the single blades of the skates. We saw other people down the shoreline looking like they were having a great time, so we headed off to join them. There is nothing like peer pressure to make one jump into a situation. Along the way we stopped to examine the damage to other docks and areas where the ice was piled up high. A small group playing hockey with makeshift sticks, brooms, and a can of StarKist tuna called for us to join them. With no hockey sticks, we just waved and kept moving, past families who were slipping and falling and pulling kids on sleds. Farther out from shore, we saw makeshift huts constructed right on the ice, with smoke rising from their peaks. Getting our ice-legs, we raced each other out to the sheds. I won. As we glided to a stop, a man came out of one to relieve himself on the lee side of the hut. He invited us in, and since it was cold standing in the wind, we joined him and his two brothers inside. A kerosene heater and smiles all around welcomed us into their cozy abode. Simply being out of the wind felt good. The brothers sat around three holes bored through the ice. Dressed in Carhardt overalls, they were relaxing on lawn chairs with a half-empty case of beer beside them. It was eleven o’clock in the morning. Clearly they were proud of their castle and planned to make a day of it. The bluish-white ice, about eight inches thick, seemed a little less permanent as I peered down the holes into the clear, cold water below. I grew uneasy staring into the chilly depths and wondered if eight inches of ice could hold the five of us so close together. Slowly I edged back, closer to the wall. Each hole was outfitted with a hand-made rig with a flag over it, and with a heavy line going down into the water. The brothers had already pulled in half a dozen nice-sized fish and smoked at least a pack of Kools based on the number of butts strewn about the icy floor. The oldest brother pulled in a perch while we stood there, and I asked him what if they caught a really big fish that couldn’t fit through the six-inch hole. They all laughed and said if that happened they would get busy really fast cutting a bigger hole. Greg and I left the warmth of the hut, too young for beer, cigarettes, and stories of the good old days; after all we were twelve. The sun was now out, and feeling adventuresome, we took off, letting the breeze push us farther out across the bay. We felt free, brave, and full of ourselves. At noon we realized we were tired, hungry, and several miles from shore, so we came to a stop to talk about where to go next. We were a bit disoriented, being about midway between the eastern and western shores. The horizon seemed the same no matter where we looked. While standing still, realizing how far we were from shore, a loud crack like a rifle shot ripped through the ice and up through my body. My heart sank into the depths of my toes, my legs shook, and my confidence vanished. It felt like an earthquake erupting beneath my wobbly knees. 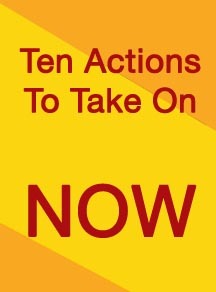 With no time to think, we bolted. Assuming that at any moment the ice would open up and our bodies would slide into the icy water, we didn’t really care which shore we got to as long as we made it. Greg and I ran on the serrated tips of our skates. We didn’t even slow down to glide on the runners for at least the first hundred yards. Then came another rifle shot, and fresh images of the ice opening up right behind me flashed in my brain. I knew that at any moment I could be swallowed up and instantly frozen beneath the ice. Halfway to shore, with our legs cramping up, we each pointed in different directions trying to figure out which cove to aim toward. 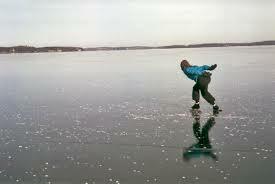 Finally we found the right pier and skated in, bouncing over the rough ice and collapsing on the shore. We lay there panting for several minutes, sweat running down our faces. Eventually we turned to face the bay and saw that the ice had not opened up. People were still out there, and someone was even driving a car out on it. We looked at each other, puzzled at what had just happened. Later we learned that the ice had been adjusting to the sun. That causes stress cracks to form, but the cracks do not open up or cause a shifting of the plates. Nevertheless, we felt safer on land and slowly removed our sore feet from the skates before going inside for hot cocoa and lunch. I never told my parents about being out on the bay, about the guys drinking beer, or about the cracking ice. I just told them how much fun I’d had skating with Greg. 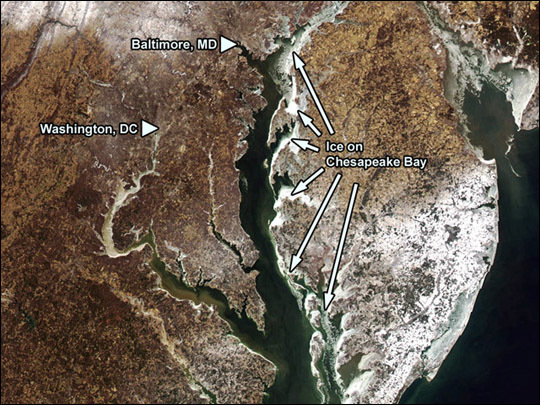 Take-a-way: The Bay does not freeze over as much as it did prior to the main impacts of global warming. Do not try skating on the Bay today! For more anecdotes about growing up on the Bay, order The Chesapeake Watershed: A sense of place and a call to action from www.Amazon.com. By nedtillman2 in Oceans on February 19, 2015 .